$249.95 & FREE Shipping on orders over $59. Chill your beer in the summer and warm your beer in the winter! Temperature control during fermentation is one of the keys to making world class beer at home. It can be difficult to achieve however, often requiring you to have a temperature controlled refrigerator dedicated to fermentation. 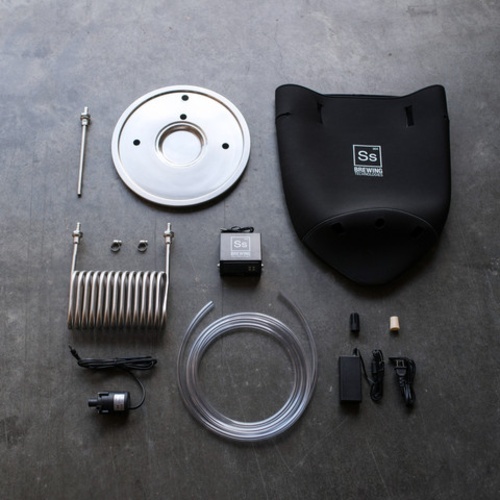 Now with the FTSs temperature control package and either a Brew Bucket or Chronical, you can maintain perfect fermenting temps all year. 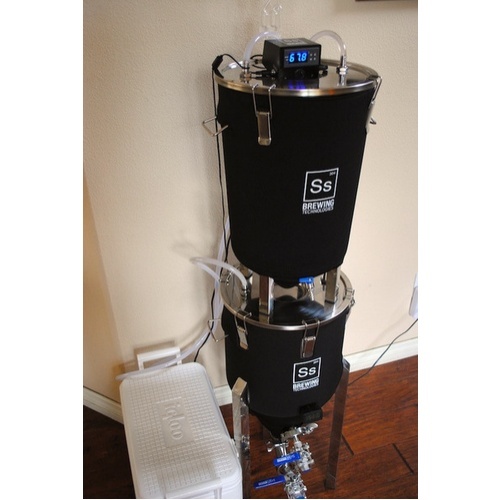 This particular unit is designed to work specifically with the 7 gallon Brew Bucket. The system is elegant and engineered to be as compact and affordable as possible. 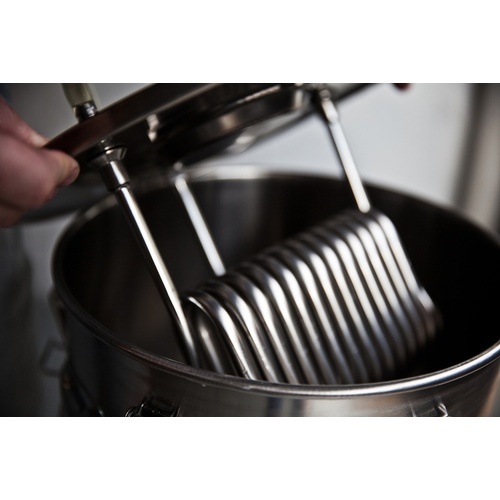 The FTSs uses a precision digital temperature controller in combination with a 304 stainless steel immersion chiller. 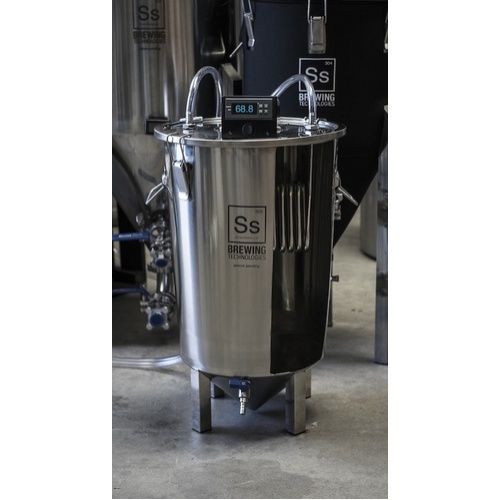 The digital controller constantly monitors your beer’s temperature and will activate the very quiet circulation pump to hold the fermentation temperature at your predetermined set point. You can cold crash or lager too! You supply the chill water source, which can be as simple as ice water in a cooler or as involved as glycol from a chiller’s reservoir. We supply the rest of the system. 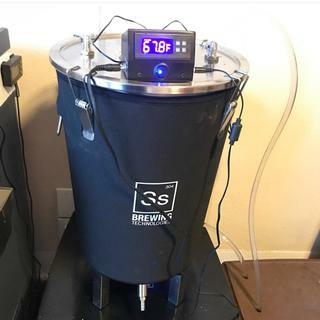 As long time fellow home brewers, this is a system we know many of you have been dreaming about for a long time: advanced temperature control for the beers you make at an affordable price. Please Note: This Product is an add on for a BrewBucket, and DOES NOT INCLUDE the brewbucket itself. Wanted to ferment in an area that gets a bit hot. This system is amazing! Once the lid is assembled and the parts have all been cleansed and passivated, everything is very plug-and-play. It eliminated all the temperature babysitting I would otherwise have to do and I'm already loving it after just one brew. The only one major drawback is that the seams on the neoprene fermenter cover are very fragile and started coming apart the moment I put it on my brewbucket. This would be fine if I never had to take it off, but I'd like to have the option of doing so; that way it would be easier to avoid getting water, cleaning products, trub and whatnot else mixed up in it when cleaning the fermenter. Works amazing down here in Texas. Keep a couple 2 liter pop bottles frozen in the freezer and just cycle them. Love this! Living in Florida and controlling temps isn't easy. I had an old fridge that I was using as a ferm chamber in my garage but something about fermenting in the garage didn't appeal to me. I bought this and use a bucket of water in my keezer as a chill water source and haven't looked back. I just ordered a second ftss for my other brew bucket since this works so well for me. I used this for the first time yesterday and it really is a remarkable product. I found out from researching SSBrewTech the FTSS can also be used as a wort chiller which really sealed the deal. I got my porter down to pitchable temperatures in no time! Now all I need to do is wait a few weeks for bottling, no more worries about temperature fluctuations during fermenting. Highly recommended! I love my fermenter. The conical bottom produces a clean beer. Customer service was great. I had a small issue with my gasket creating a gap when tightened. The response was immediate and fixed my problem. I use 2 of these on brew buckets and 1 on a 14gal chronical. I use them with a homemade glycol chiller (found direction from a link on SS brewing's website). The temperature control is awesome and effective. I love using this in both winter and summer and can even crash my beers with this system. The only two real problems I have are that the inlets for the thermocouple and the heat exchanger are based on o-rings which makes it hard to know if you have a good seal. The next nasty problem is that the heat exchanger is barb connects which makes it a HUGE pain to remove and clean since you have to remove worm clamps and pull the hose off the hard way to to clean the lid.